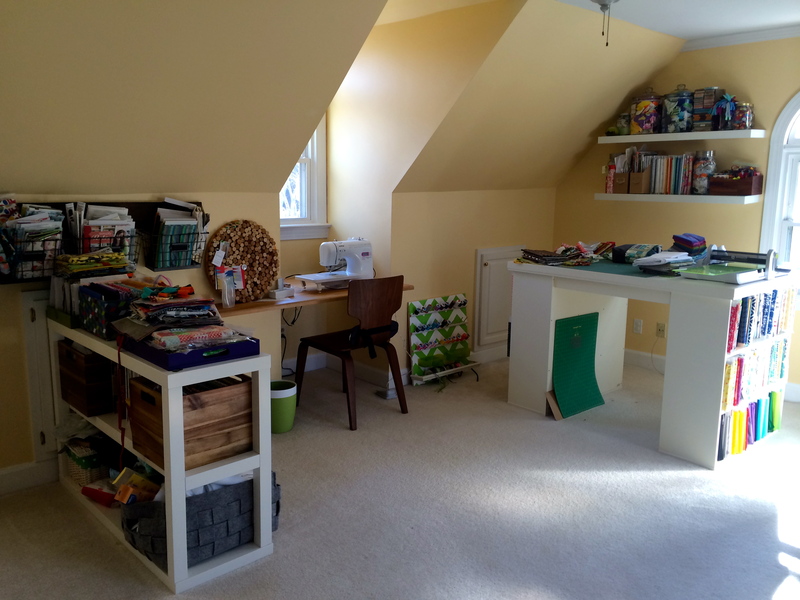 A while back I posted about my sewing room (here and here), which I have to say I love and was working for me. I still have not resolved my design wall issue (I am still using portable boards), but I have made some other updates that are still in progress. I will admit, I am having to work out how to use all my space, as I need more room mostly due to fabric buys and WiPs/Projects for the year. Adding a rack at the bottom of the shelves for hanging quilts etc. These are the items already to go and be hung on the rack when it’s up. In between the project desk/cutting table/fabric storage and my sewing machine, I plan to hang my craft storage board I made (with the hubby’s help). I want to say, I work better when things are more organized. 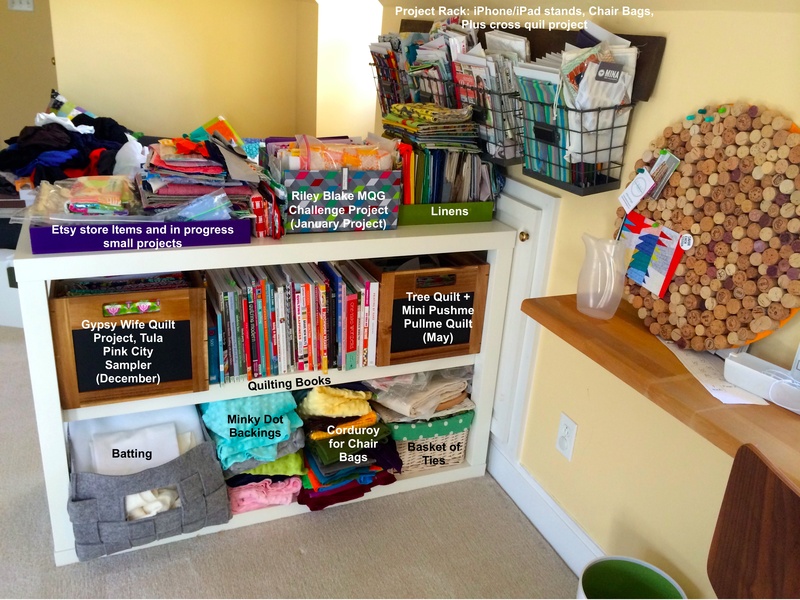 I am not sure if this is me procrastinating or actually coming up with more creative ways to store fabric…anyway the next photos show, in my re-organization, I have invested in project bins for my 2014 goals. My bookcase + Project Rack are full of lots of possible projects, some additional supplies and my craft books. Finally, I thought I would give you an overview of the main space, with the current updates collectively. Linking up with Lee @ Freshly Pieced for WiP Wednesday (see link on right menu). 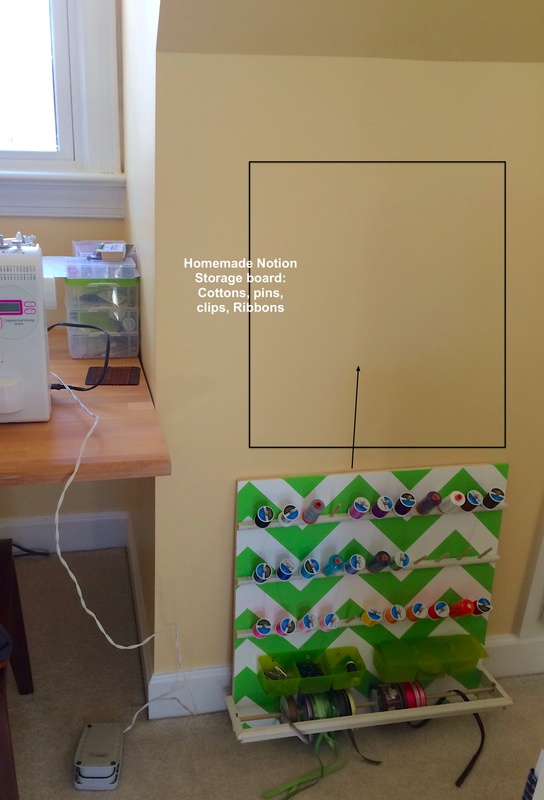 This entry was posted in Uncategorized and tagged Creative space, furniture, interior design, organization, project bins, sewing room, Sewing room design, storage, wall shelves, WiP Wednesday, Work Space on January 22, 2014 by mlwilkie. I also have the pottery barn table. Just love it and I use the same type of jars for my scraps ! Obviously you have great taste LOL!!! Isn’t that table fabulous though….I love it, it is my favorite thing. your space is amazing. i love the lighting, the storage, the flow. everything. such a great room – and inspiration for when we finally buy a house! It looks like a lovely space to work in =jealous of you!!! It is, the light is great (though makes it a little difficult for photos), the dedicated space is definitely wonderful. Now I only need to spend more time in it other than the weekends. Wow! Everything is nice and neat and sew well organized. Love it! Come on over and Let’s Bee Social! I would love to have such room as a sewing room. 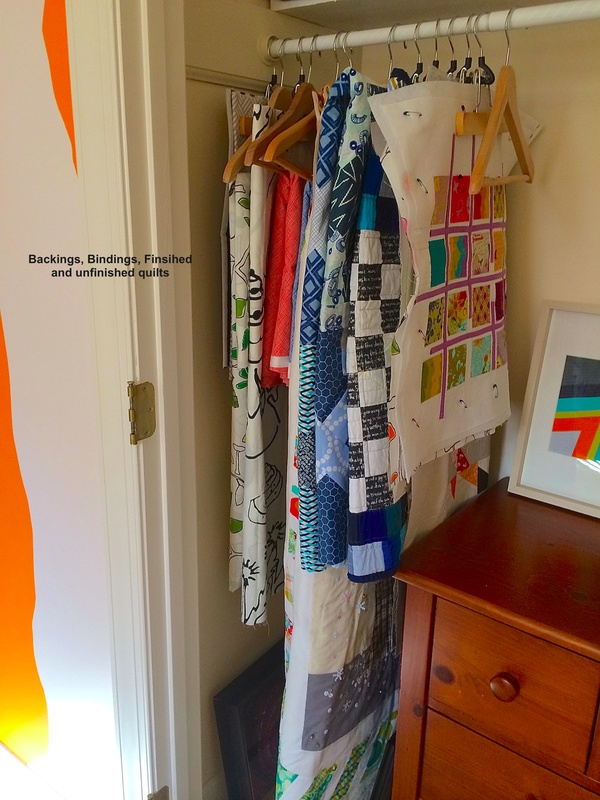 We are moving next month and I hope I can afford a design wall hanging… I love your craft storage board, have you made it? It is so difficult in Spain to find a thread holder like that. Yes we made it. I designed it and painted it, my husband did the hole drilling and cutting. Your space looks lovely. I am fortunate that I have made my whole living room into a studio — and I love it! My cutting/work table is a door mounted on a pair of bookcases, just the right height for standing work. I made my ironing station from a piece of plywood (20″ x 48″) with several layers of batting and a cover. I mounted it on another bookcase, and it works great! My sewing table is another, smaller, door mounted on file cabinets. Most of my fabric is stored by color on open shelves that take up one whole wall, which I also did myself. There’s nothing very classy here, but it is a great place to work! I do need better lighting, though; I am working on that. You must find another place for that mat under your work table — mats need to be stored flat or they will take on that curve at the bottom permanently, and be ruined (I learned this the hard way!). You could put it under the one you are using if they are the same size. I wish you many happy hours in your studio! 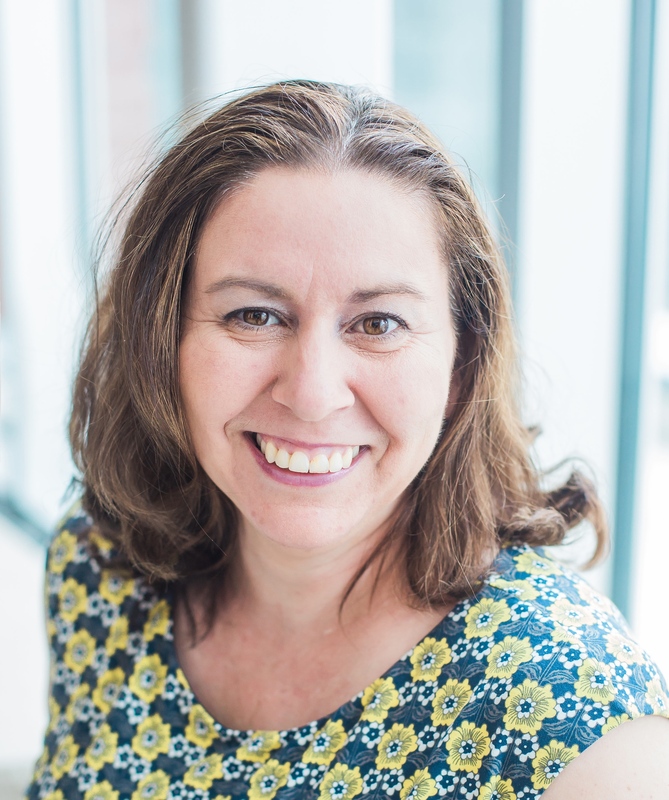 You have your monthly projects allocated already?! You are organised!! Love your desk space between the walls. Perfect space! It looks great in there! I wish I was able to set myself up properly like that! Bravo! What a great room! 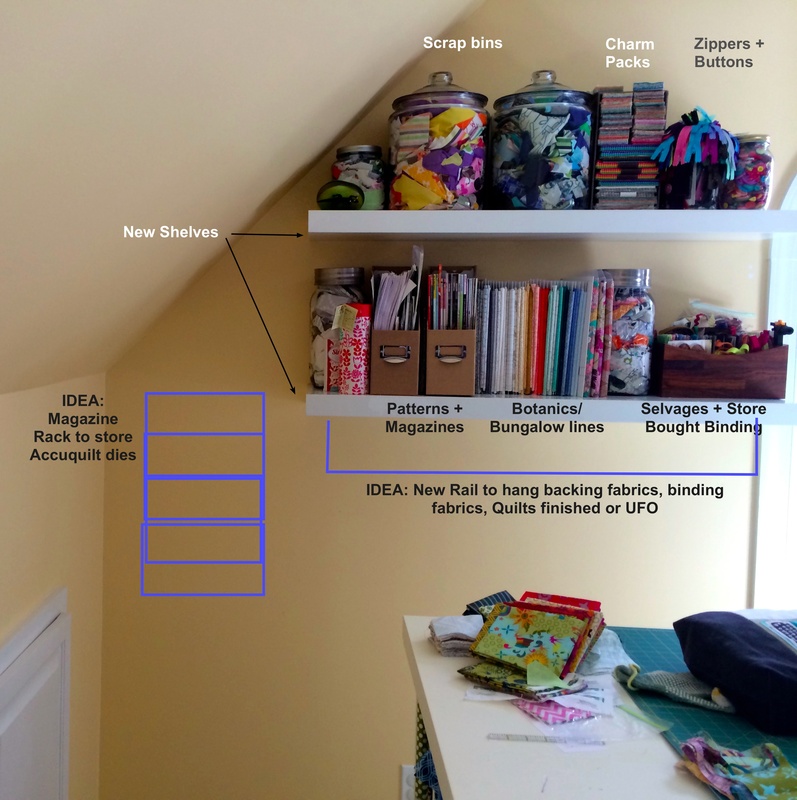 I , too, find that I am considerably more productive when the sewing room is organized. Love your thread rack! I love all of your inventive storage nooks and crannies and jars and boxes. You should submit your space to HGTV as a perfect craft loft! I love this system, I can’t wait to see it evolve. I am super envious of your space as it is now. Love the fabulous organization and I am very jealous of all your wonderfully lit space but how the heck do you have just two small jars of scraps. I did not think it was possible. Wow,not a thread out of place! Thanks for the craft room inspiration.